The groom to be and his family members (about 5 -10) visit the bride’s home to introduce and make known their intention to the brides parent. They mostly use words like, “we saw a beautiful flower or a she-goat and will want to take it along with us, sir we need your permission”. On arrival on a specific day, the girl’s family entertain their guest with drinks and kola nut, and then the girl’s father gives his guest money for their trouble finding their way to his house. 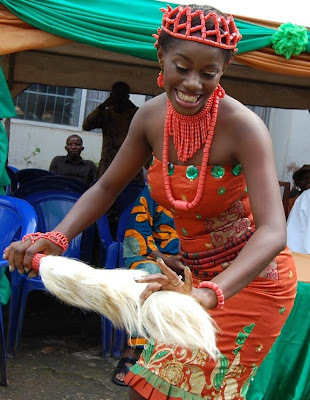 The groom family will reciprocate by offering the girls family their own drinks and kola nut, then paying back two times the money they gave them earlier. They will be merriment with a lot of food and drink, then after entertaining his guest the girl father will bring out all his daughters, sisters even older women for the groom to identify his future wife. This is done to test if he actually knows who he wants. If the girl he seek is not among the ladies brought out for him, he can demand for the particular person he seeks. When she comes out and he identify her, there are applauds and singing all over the place. At this second coming the groom presents his gift (different type of drinks and kola nut), the girl will be summoned and she will be asked if she knew the man and want to marry him. She has to agree to the proposal before his gift will be accepted and for the ceremony to processed. The girl’s father introduce the man to some of his family member about 5-10 and about 5-3 of the mother’s family. The groom must visit these people one after the other and he must fulfill every request they ask of him. Then a date is fixed where all the parent family will meet with the prospective groom, this is done to join both family ones more, the bride price is negotiated and agreed on. List of required items needed by the girl’s parent is given to the man to buy or pay the equivalent. The tradition wedding ceremony is filled with funfair and celebration, with a lot of food and drinks to go round. The peak of the occasion is when the community represented by the elders comes to make their own demands, a certificate is presented to the couple after all requirements are meant. The document will be signed by the couple, these certificate authenticate the union. The amount paid for the certificate ranges from N5000 above for a groom from within that community while those from outside will pay N10000 and above. After everything the bride will be sent off with kitchen utensil, home gadget, boxes of clothes and wrapper. Can I get the list please because I want to have an idea of the amount for my wedding to an isoko Lady.. Thanks this is my email address: ajalaj7@gmail.com.. I will kindly appreciate if I can get the list.